This recipe is easy and impressive. Also, you can get some aggression out by using a rolling pin like a baseball bat. Place each chicken breast in a ziplock bag, sealing it shut except for a half an inch to let the air out. Take your rolling pin and beat the crap out of it. 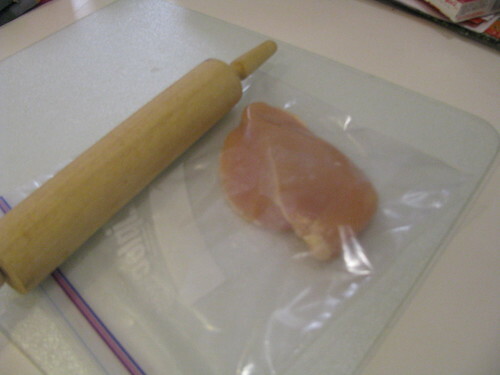 This tenderizes the chicken and also flattens it. And it will make you feel better. Heat 2 T butter and some oil in a skillet and brown chicken breasts, seasoning with salt and pepper, until they are nearly cooked. 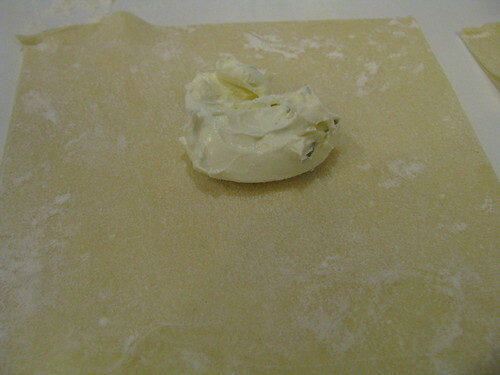 Roll out your pastry or pie crust. Using a knife, cut four 7 inch squares*, one for each chicken breast. 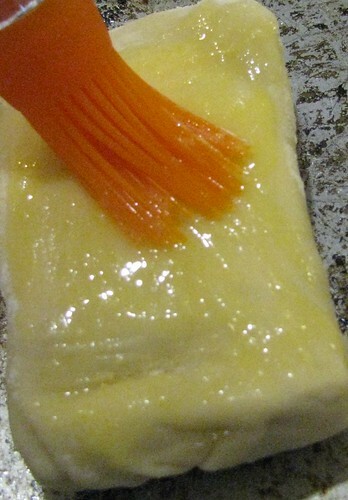 In the center of each pastry square, place about 2 T of the cream cheese. 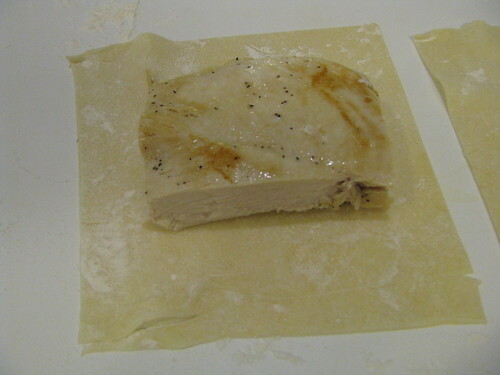 Brush the edges of the pastry with water or egg wash, and fold up, wrapping your chicken like a present. Place them seam side down on a greased baking sheet. 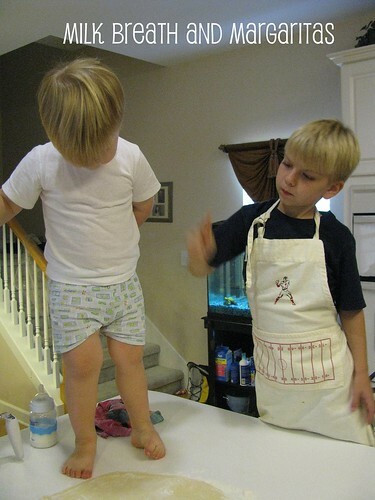 Bake at 400 degrees for about 20-25 minutes or until golden brown. These are delicious! If I were making them for company, I would take the pastry trimmings, roll them out, and either cut shapes with tiny cookie cutters or cut long thin strips and braid them. Place the shapes, or lay the braid, across the top and then do the egg wash. It is a simple extra step that will make them look really pretty. Tip 1: Let the chicken cool off before you wrap it. 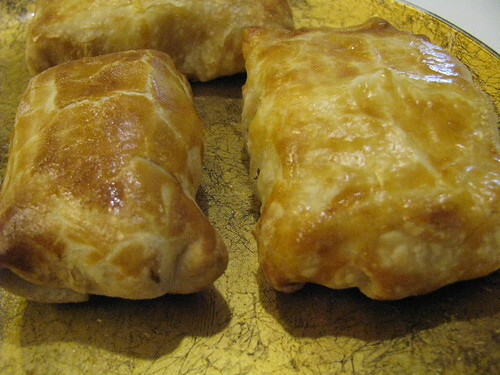 If it is too warm the pastry gets melty and is harder to work with. *Tip 2: The original recipe said 7" squares. I've yet to find a chicken breast that will fit that size. I always have to do larger squares or cut the chicken to a smaller size. It's no big deal, but you'll have to judge it when you get to that step. Enjoy! More Mouthwatering Monday from Rachel here. My Mouthwatering Monday history here. Rachel - I know! All the best stuff right there. It's going on my menu for this week. Looks so good! This looks fabulous and yes, easy! I'm totally making this...soon!